Correcting the myth that Burke and Hare robbed fresh graves for bodies, this is a story of two men who make a shortage of hanged prisoners and a surplus of vulnerable people into a deadly combination. Hare and his wife own an inn, and it’s here that they find most of their victims. Mrs Hare is very much in the game as well – also true to history. The script commendably brings women back into stories they’ve since been written out of, even if in this case some of the women are just as unsavoury as the men. Some of the characters are underwritten and there are a couple of baggy subplots that don’t add much to the central narrative, though. There are some jokes in poor taste, but most are benign. Folk songs provide effective transitions and more opportunities for comedy. The three, multi-rolling actors (Katy Daghorn, Alex Parry and Hayden Wood) are engaging and fun, with some lovely moments of vulnerability. Their vibrant performances and snappy dialogue drives the show onward, though it’s a touch too long and doesn’t need an interval. Combining narration, audience interaction and Victorian music hall influence to tell a grim tale of death in historical Scotland, this is a richly textured script paired with a cracking creative team. There are plenty of moments that elicit a chuckle, and the piece’s polish is certainly impressive. 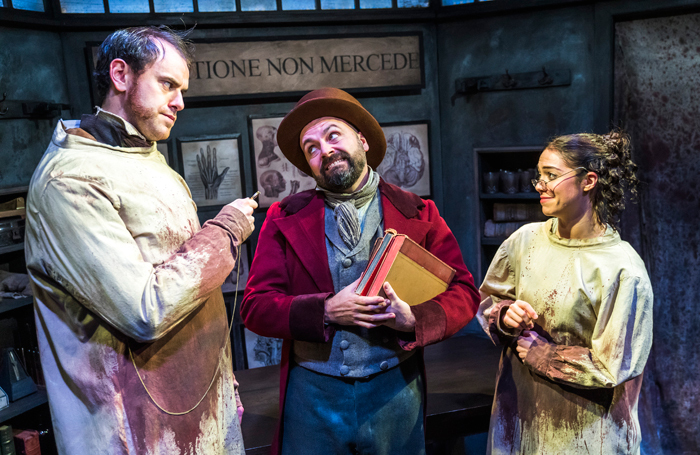 Burke and Hare runs through 21 December.